Azure App Services can make use of Client Certificate Authentication. The options for this are not available in the portal and need to be configured manually. The same way can also be used for for example an Azure API App. The below option is a option for setting the same property in a different way. 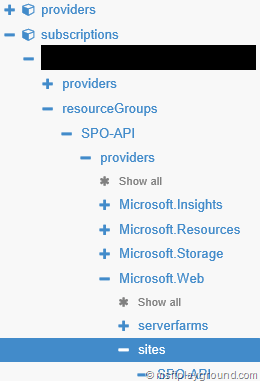 Open https://resources.azure.com/ and login with the same credentials as the Azure Portal. Make sure the interface is set on “Read\Write” mode. Click the “Edit” button on the op of the screen. Find the property “clientCertEnabled” and set it to “true”. Click the “PUT” button on top to save your changes. With the Azure resource configured you need to make sure that your application is able to use Client Certificate Authentication. Keep in mind that your Azure resource does not validate your Client Certificate! It only requires you to supply a certificate when opening the application. That requires you to write your own logic for validating the certificate. In the blog post mentioned above there is class for validating the certificate. Based on this example I have created a Certificate Authorization Attribute. /// Indicates whether the specified control is authorized. /// true if the control is authorized; otherwise, false. /// Determines whether [is valid client certificate] [the specified certificate]. With the attribute implemented it can be used on a Controller method for example. Make sure you do not forget to add the following xml node to your web.config and call your application with https. If you do not do this your certificate will not be recognized in your request. Testing your application can be done by using the HttpClient to perform a request. Hi, we are getting “The page cannot be displayed because an internal server error has occurred.” when we add “” to the web.config. We have also updated the Any idea why or if there is anything else we need to modify? Did you turn off the custom errors, and did you make every configuration change? (Also on the Azure side). Keep in mind that when using Certificate Authentication you will need to open the site in the https form. Ahhh thank you so much for this! Hi, Is it possible to enable client certificate only to a specific path? For example adding the following element to web.config, Is there any way to set clientCertEnabled true only for the same path? In the web.config you can’t enable client certificate for only a specific path. What you could test is not applying the attribute to specific controllers and test if it works when you do not apply a certificate to that specific controller. Do we need to upload any key (public key of client cert or CA which used to sign this client cert) to Azure? No, the validation of the provided certificate needs to be build by your self. Thanks for your response. So you mean if someone has my client info (likes CN, serial…), they can generate certificate and use it? Sounds like it turns to Knowledge Factor instead Ownership, and why Azure have option that let us upload public key to it? That is true. Depending on the things that you validate people could generate a certificate, in that situation they should know the properties on which you validate the certificate. That was the only option there was at the time of writing the article do not know if there is a better solution as this time. I would guess there is because there is also a keyvault which can contain certificates.